Rockstar Games is keeping up with the Red Dead Redemption 2 beta, and next week will see a newest update featuring loads of new features. You’ll gain access to Free Roam Events, new races, Showdown Modes, new weapons, extra clothing, more emotes, and a variety of balancing changes and improvements. Let’s dive into all the new features you’ll get to experiment with. Kicking things off is the inclusion of the Fool’s Gold Free Roam Event. This mode will pit players against each other to gain control a Golden suit of armor, in traditional Rockstar fashion. Be careful if you get acquire the armor though, as the rest of the players will be on your tail. The update will also include new fishing challenges that are broken up by type. You’ll be tasked with catching the largest fish to win. The inclusion of three new Showdown Modes will be added, too, wherein you’ll face other players to capture and deliver bags. Rockstar has noted that there will be more updates for Up in Smoke, Spoils of War and Plunder coming soon. 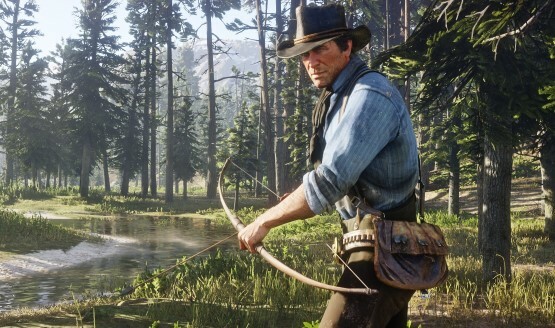 There will also be a new addition to races with the Target Races mode, which requires you to shoot targets while on horseback. Hopefully, you’re looking forward to new weapons, as well, because the update will throw some at you. You’ll gain access to the high capacity Evans Repeater rifle and a new double-barreled shotgun, both of which will be available at the Wheeler & Rawson Cataloge and local Gunsmiths. Additionally, you’ll see a new set of clothing from the Diamondback Hat to a fur-trimmed Rutledge Vest, as well as new jackets, boots, and hats. Check out the Catalog to see more on that. This update will also have new Emotes including taunts and greetings. PlayStation 4 users will have early access to Open Target Races and the Jawbone Knife, which should come in handy. There will also be three new Emotes and clothing options. Rockstar has also announced a 20% XP boost going on this week leading up to the release of the update on February 26, 2019. Be sure to download the update next week to take advantage of all the free content Rockstar Games has been pumping into Red Dead Online.